Below is information on the types of wire available for cables on this website to help you make a more informed decision for your purchase. I have included a review/description of many of the wire types as well as a comparison chart at the bottom of the page. Some of the information supplied here is subjective and not necessarily supplied as fact. The information in the chart is up-to-date and accurate, to the best of our ability. Mogami wire is without a doubt the finest wire we work with. The majority of studios we work with use Mogami wire. It can be the higher-priced of the wire we sell, but far worth the price in quality. We think it's even better than Monster cable, for a far better price. Mogami cable is very flexible, durable, and sounds excellent. Everyone loves the quality and sound of it. If you want what the real studios use, choose Mogami. Canare is also a top grade wire. The major difference between Mogami and Canare is that Canare uses mostly braided shields and Mogami uses wrapped shields. There is no doubt that a braided shield will hold up better than a wrapped shield. As a cable is moved it can create gaps in a wrapped shield but the braided will not shift. With that said a good wrapped shield will have fewer gaps when new than a braided shield. This also can create a difference in how the cable wraps, with some people commenting that they do not like how Mogami wraps. In any case, we added Canare wires to our line because of the difference is shielding. Generally, the sound of Mogami will be slightly better, but in some applications there may be the need for the benefit of better wrapping or of the durability of the braided shield. Ok, so you say "Mogami or Canare sounds great but we are on a tight budget." Well then, we can gladly recommend Horizon cable. We have used it in studios with smaller budgets, and musicians use it all over the world. Horizon wire is great wire with a budget price. Horizon wire is flexible, durable, and sounds great- the next best thing to Mogami or Canare. If you want the high quality budget-wire that millions of others use, choose Horizon. Gepco makes many cable types but our main use for them has been video and DMX lighting cables. Due to supply issues we have been replacing the Gepco cables with Clark Wire. Clark Wire is not as well known as Gepco, it was actually started by some of the designers from Gepco. Their products are very high quality and comparable with Gepco. We plan to mostly just carry video and DMX cable, but would be happy to fill any special requests. Carol Brand wire is what we turn to when our other manufactures don't make a specific cable. They make very high quality products that I think are superior to other manufacturers' similar wire types. On our site we currently offer our power cables and RG-6 cables with Carol Brand wire. We have used it for years on installations for CAT-5, coax, power, speaker cables, and more. We have been very happy with Carol Brand products and I think you will too. This is a German based company that is getting going in the USA. They make a very large variety of cable and connector products. Of their cables we have seen samples of, some are amazing and some don’t live up to our standards. We are happy to offer their products that pass our standards, especially where there is a need. If you find it on our site we are very happy with the product and only offer it because I think you will be too. This is Mogami part number W2549. It is a heavier-weight microphone-style cable that is very flexible, durable, and sounds great. This is a great cable when you need the best sound quality in a high-abuse environment. 2549 wire has 22AWG twisted-pair with served shield and gloss black jacket. This is Mogami part number W2552. This is practically the only wire we use for our sound and lighting system. It is a lightweight microphone-style cable that is very flexible, durable, and sounds great. It will fill your needs for medium-abuse environments. 2552 wire has 26AWG twisted-pair with served shield and gloss black jacket. This is Mogami part number W3106 dual balanced cable. It is a medium-weight microphone-style cable that is a cross between 2552 and 2549 and is very flexible, durable, and sounds great. This is a great cable when you need the best sound quality in a high-abuse environment. 3106 wire has 24AWG twisted-pair with served shield and black jacket, all in a zip cord (dual channel) arrangement. This is Mogami part number W2534. It is a heavier-weight quad microphone-style cable that is very flexible, durable, and sounds great. This is a great cable when you need high sound quality in a high-abuse environment. 2534 wire has 24AWG twisted-pair with served shield and gloss black jacket. ** Quad cable is great at reducing noise, but due to its higher inductance and capacitance it will not sound as good as a comparable standard mic cable. We recommend that you only use quad in high RFI (Radio Frequency Interference) environments or where you have a problem with noise pickup. This is Mogami part number W2697. This wire is designed for applications where a super thin cable is required. It is a light-weight microphone-style cable that is very flexible, quite durable, and sounds great. This is a great cable when you need the best sound quality in a medium-abuse environment. 2697 wire has 28AWG twisted-pair with served shield and gloss black jacket. This is Mogami part number W2944. This wire is specified as "console cable" but is great for applications where a super thin cable is required. It is basically the same wire as the Mogami snake cable internal wires. It is a light-weight microphone-style cable that is very flexible, quite durable, and sounds great. This is a great cable when you need the best sound quality in a medium-abuse environment. 2944 wire has 25AWG twisted-pair with served shield. Available in multiple colors. We stock red and white for stereo/dual cables. This is Mogami part number W2791. This wire is designed for life on the road with the quality of the studio. It is a medium-weight microphone-style cable that is very flexible, very durable, and sounds great. This is a great cable when you need the best sound quality in a very high-abuse environment. 2791 wire has 24AWG twisted-pair with braided shield and gloss black jacket. This is Mogami part number W2792. This is designed to reduce microphonic handling noise to very low levels. It is a medium-weight microphone-style cable that is very flexible, durable, and sounds great. This is a great cable when you need the best sound quality in a medium-abuse environment. 2792 wire has 26AWG twisted-pair with served shield and conductive PVC and gloss black jacket. This is Mogami part number W2893 (mini quad). It is a lightweight quad microphone-style cable that is very flexible, durable, and sounds great. It will fill your needs for medium-abuse environments. 2893 wire has 26AWG twisted-pair with served shield and gloss black jacket. This is Canare part number L-2T2S. It is a heavier-weight microphone-style cable that is very flexible, durable, and sounds great. This is a great cable when you need the best sound quality in a high-abuse environment. L-2T2S wire has 23AWG twisted-pair with a braided shield and gloss black jacket. This is ProCo Siamese Twins part number STC1A1P14D. This has a 14 AWG power cord and a DMX/AES/Audio line paired together with an overall jacket. The overall jacket has a diameter of .485". The Audio cable is heavyweight 24 AWG twisted pair with foil and served shield. Great for medium/high-abuse environment. This is Horizon part number Lo-Z1. It is a medium-weight microphone-style cable that is very flexible, durable, and sounds great. This is a great cable when you're on a smaller budget and need the excellent sound quality in a medium-abuse environment. Lo-Z1 wire has 24AWG twisted-pair with served shield and matte black jacket. ** Now A RapcoHorizon product with part numbers LO-Z1, MIC1, and RSMCA. This is Horizon part number Lo-Z4. It is a medium-weight quad microphone-style cable that is very flexible, durable, and sounds great. This is a great cable when you're on a smaller budget and need the excellent sound quality in a medium-abuse environment. Lo-Z4 wire has 24AWG twisted-pair with served shield and matte black jacket. ** Now A RapcoHorizon product with part numbers LO-Z4, MIC4, and QUARAPLUS. This is Horizon part number Lo-Z5. It is a heavyweight microphone-style cable that is very flexible, durable, and sounds great. This is a great cable when you're on a smaller budget and need the excellent sound quality in a high-abuse environment. Lo-Z5 wire has 20AWG twisted-pair with braided shield and matte black jacket. ** Now A RapcoHorizon product with part numbers LO-Z5, MIC5, and PRO-MIC. This is Mogami part number W2319. It is a lightweight guitar-style cable that is very flexible, durable, and sounds great. This is a great cable when you need the best sound quality in a medium-abuse environment. 2319 wire has 23AWG center conductor with served copper and conductive PVC shield and gloss black jacket. This is Mogami part number W2524. It is a heavyweight guitar-style cable that is very flexible, durable, and sounds great. This is a great cable when you need the best sound quality in a medium-abuse environment. 2524 wire has 20AWG center conductor with served copper and conductive PVC shield and gloss black jacket. This is Mogami part number W2368. It is a super thin, lightweight guitar-style cable that is very flexible, durable, and sounds great. This is a great cable when you need the best sound quality in a medium-abuse environment. 2368 wire has 28AWG center conductor with served copper and gloss black jacket. This is Mogami part number W2528. It is a lightweight dual unbalanced cable that is very flexible, durable, and sounds great. This is a great cable when you need the best sound quality in a high-abuse environment. 2528 wire has 25 AWG center conductors with served copper shield and gloss black jacket, all in a zip cord (dual channel) arrangement. This is Canare part number GS-6. It is a heavier-weight guitar-style cable that is very flexible, durable, and sounds great. This is a great cable when you need the best sound quality in a high-abuse environment. GS-6 wire has 18AWG center conductor with braided copper and conductive PVC shield and gloss black jacket. This is Horizon part number Hi-Z1. It is a medium-weight guitar-style cable that is very flexible, durable, and sounds great. This is a great cable when you're on a smaller budget and need the excellent sound quality in a medium-abuse environment. 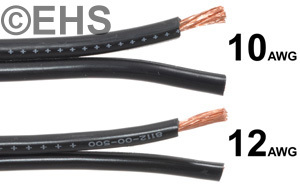 Hi-Z1 wire has 24AWG center conductor with served copper and conductive PVC shield and matte black jacket. ** Now A RapcoHorizon product with part numbers HI-Z1, INST1, and SF24GA. This is Horizon part number Hi-Z2. It is a medium-weight mini guitar-style cable that is very flexible, durable, and sounds great. This is a great cable when you're on a smaller budget and need the excellent sound quality in a medium-abuse environment. Hi-Z2 wire has 20AWG center conductor with served copper and conductive PVC shield and matte black jacket. ** Now A RapcoHorizon product with part numbers HI-Z2, INST2, and SOUNDFLEX1. This is Horizon part number Concert1. It is a heavyweight guitar-style cable that is very flexible, durable, and sounds great. This is a great cable when you're on a smaller budget and need excellent sound quality in a high-abuse environment. Concert1 wire has 20AWG center conductor with braided copper and conductive PVC shield and matte black jacket. ** Now A RapcoHorizon product with same part numbers. This is Mogami part number W2964. It is a medium-weight coax 75 ohm style cable that is very flexible, durable, and sounds great. It will fill your needs for high-abuse environments. 2964 wire has 24AWG center conductor with served shield and gloss black jacket. This does not confirm to a standard RG cable size, Mogami provides specifications to 10 MHz with attenuation of 1.9 dB at 10 MHz for 100Ft. According to the Mogami reps it will support 3G SDI at a maximum of about 100Ft but for optimal performance the maximum is at 50Ft. This is Mogami part number W2965. It is a medium-weight dual coax 75 ohm style cable that is very flexible, durable, and sounds great. It will fill your needs for high-abuse environments. 2965 wire has two lines each with a 24AWG center conductor and a served shield and gloss black jacket. This does not confirm to a standard RG cable size, Mogami provides specifications to 10 MHz with attenuation of 1.9 dB at 10 MHz for 100Ft. According to the Mogami reps it will support 3G SDI at a maximum of about 100Ft but for optimal performance the maximum is at 50Ft. This is Horizon part number RG59.MK. It is a medium-weight coax 75 ohm style cable that is very flexible, durable, and great performance. It will fill your needs for medium-abuse environments. 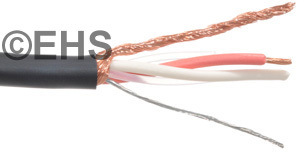 RG59.MK wire has 24AWG stranded center conductor with a 95% braided shield and black jacket. It is a RG-59B/U style cable with 1 GHz bandwidth with an attenuation of 12.8 dB at 1 GHz for 100Ft. This is Carol RG-6U C5775. It is a medium-weight coax 75 ohm style cable that is moderately flexible, durable, great performance. It will fill your needs for low abuse environments, best for studio or installed applications. RG-6U wire has 18AWG center conductor and dual shields 100% foil and 60% braided shield and black jacket. It is a RG-6/U style cable with 3 GHz bandwidth with an attenuation of 11.79 dB at 3 GHz for 100Ft. This is Clark Wire part number CD7506F. It is a medium-weight coax 75 ohm style cable that is very flexible, durable, and offers great performance with low attenuation. It will fill your needs for medium/high abuse environments, best for studio, live, or installed applications. CD7506F wire has 19AWG stranded center conductor and dual 90% braided shields and black jacket. It is a RG-6 HD style cable with 4.5 GHz bandwidth with an attenuation of 19.8 dB at 4.5 GHz for 100Ft. This is Clark Wire part number CD7506. It is a medium-weight coax 75 ohm style cable that is moderately flexible, durable, and offers great performance with low attenuation. It will fill your needs for medium abuse environments, best for studio or installed applications. CD7506 wire has 18AWG solid center conductor and dual shields, 95% braided and 100% foil shields and black jacket. It is a RG-6 HD style cable with 4.5 GHz bandwidth with an attenuation of 13.3 dB at 4.5 GHz for 100Ft. This is Gepco part number VE61859M. It is a medium-weight coax 75 ohm style cable that is very flexible, durable, and offers great performance. It will fill your needs for medium/high abuse environments, best for studio, live, or installed applications. VE61859M wire has 22AWG stranded center conductor and a 95% braided shield and black jacket. It is a RG-59 style cable with 1 GHz bandwidth with an attenuation of 10.64 dB at 1 GHz for 100Ft. This is Gepco part number VHD1100. It is a heavy-weight coax 75 ohm style cable that is moderately flexible, durable, and offers great performance with very low attenuation. It will fill your needs for medium abuse environments, best for studio or installed applications. 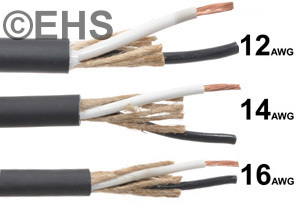 VHD1100 wire has 14AWG solid center conductor and dual shields, 95% braided and 100% foil shields and black jacket. It is a RG-11 HD style cable with 4.5 GHz bandwidth with an attenuation of 8.75 dB at 4.5 GHz for 100Ft. This is Gepco part number VHD2000M. It is a medium-weight coax 75 ohm style cable that is very flexible, durable, and offers great performance. It will fill your needs for medium/high abuse environments, best for studio, live, or installed applications. VHD2000M wire has 21AWG stranded center conductor and dual 95% braided shields and black jacket. It is a RG-59 HD style cable with 3 GHz bandwidth with an attenuation of 19.60 dB at 3 GHz for 100Ft. This is Gepco part number VHD2001M. It is a medium-weight coax 75 ohm style cable that is very flexible, durable, and offers great performance with low attenuation. It will fill your needs for medium/high abuse environments, best for studio, live, or installed applications. VHD2001M wire has 19AWG stranded center conductor and dual 95% braided shields and black jacket. It is a RG-6 HD style cable with 3 GHz bandwidth with an attenuation of 15.63 dB at 3 GHz for 100Ft. This is Gepco part number VSD2001. It is a medium-weight coax 75 ohm style cable that is moderately flexible, durable, and offers great performance with low attenuation. It will fill your needs for medium abuse environments, best for studio or installed applications. VSD2001 wire has 18AWG solid center conductor and dual shields, 95% braided and 100% foil shields and black jacket. It is a RG-6 HD style cable with 4.5 GHz bandwidth with an attenuation of 13.28 dB at 4.5 GHz for 100Ft. This is Mogami part number W3080. It is a medium-weight digital AES/EBU 110 ohm style cable that is very flexible, durable, and sounds great. It will fill your needs for medium-abuse environments. 3080 wire has 25AWG twisted-pair with served shield and gloss black jacket. This is Mogami part number W3173. It is a heavyweight digital AES/EBU 110 ohm style cable designed for very long runs. It is very flexible, durable, and sounds great. It will fill your needs for high-abuse environments. 3173 wire has 18AWG twisted-pair with served shield and gloss black jacket. This is Gepco part number DLC224 (4 conductor- 2 pair, dual shield). It is a medium-weight digital DMX512 120 ohm style cable that is top quality, super flexible, and durable. It will fill your needs for medium-abuse environments. Gepco DMX wire is currently the only 2 pair wire we offer with a true 120 ohm spec for DMX cables. DLC224 wire has 24AWG 4 conductor twisted with 100% Foil and 90% braided shield and black jacket. This is Event Horizon & Services part number PRO-DMX1 (2 conductor, dual shield). It is a medium-weight DMX512 120 ohm style cable that is top quality, super flexible, and durable. It will fill your needs for medium-abuse environments. We had this wire specially built for us to fill the need for a higher quality DMX single pair wire. 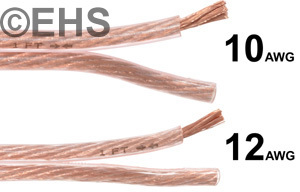 EHS DMX wire is currently the only 1 pair wire we offer with a true 120 ohm spec for DMX cables. PRO-DMX1 wire has 24AWG twisted-pair with braided and 100% foil shield and black jacket. This is Horizon part number DMX1PR (2 conductor, shielded). It is a medium-weight digital AES/EBU 110 ohm style cable that is flexible, durable, and sounds great. It will fill your needs for medium-abuse environments. 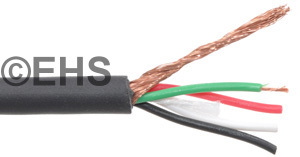 DMX1PR wire has 24AWG twisted-pair with foil shield and black jacket. This is Horizon part number DMX2PR (4 conductor shielded). It is a medium-weight dual digital AES/EBU 110 ohm style cable that is flexible, durable, and sounds great. It will fill your needs for medium-abuse environments. DMX2PR wire has 24AWG 4 conductor twisted with foil shield and black jacket. This is Mogami part number W2948. It is a medium-weight MIDI style cable that is very flexible, durable, and sounds great. It will fill your needs for medium-abuse environments. 2948 wire has 26AWG twisted-pair with served shield and gloss black jacket. This is Mogami part number W2814. It is a medium-weight 6 conductor shielded cable that is very flexible, durable, and sounds great. It will fill your needs for medium-abuse environments. 2814 wire has 26AWG conductors with braided shield and gloss black jacket. Used for 7 Pin MIDI cable or whatever your application is. This is Horizon part number MIDI. It is a medium-weight MIDI style cable that is very flexible, durable, and sounds great. It will fill your needs for medium-abuse environments. MIDI wire has 26AWG twisted-pair with served shield and black jacket. ** Now A RapcoHorizon product with part numbers MIDI, FLEXQUAD. Available soon. Contact us if you need it sooner. This is Canare part number RJC5ES-4P-BS. It is a medium-weight CAT5E style cable that is very flexible, durable. It will fill your needs for medium-abuse environments. RJC5ES-4P-BS wire has 24AWG with four twisted-pair with braided shield and black jacket. This is Sommer Cable part number SC-Mercator CAT.6 Superflex (580-0201). It is a medium-weight CAT6 style cable that is very flexible, durable. It will fill your needs for medium-abuse environments. SC-Mercator CAT.6 Superflex wire has 23AWG with four twisted-pair with braided shield and black jacket. This is a super thick cable, very flexible, and very well built. It has solid conductors but that does not affect its flexibility. We offer Horizon 16GA-10GA Commercial Series speaker cable. It is a heavy-duty rubber jacketed speaker cable with great flexibility. These cables sound excellent and are perfect for live sound applications. This is Marshall Sound Runner (Marshall Electronics) 12 GA W8112 and 10 GA W8110 speaker cable. They are a heavy-duty flat (not overall jacketed) speaker cable with amazing flexibility. These are top quality cables that sound amazing and are best for studio or fixed placement applications. This is Mogami part number W3103. It is a heavyweight 12 AWG 2 conductor speaker cable that is very flexible, durable, and sounds great. This is a great cable when you need the best sound quality in a medium/high-abuse environment. 3103 wire has 12AWG conductors with and an overall gloss black jacket. This is Mogami part number W3104. It is a heavyweight 12 AWG 4 conductor speaker cable that is very flexible, durable, and sounds great. This is a great cable when you need the best sound quality in a medium/high-abuse environment. 3104 wire has four 12AWG conductors so supports dual channel or bi-amped applications and has an overall gloss black jacket. This is Mogami part number W2921. It is a heavyweight 14 AWG 4 conductor speaker cable that is very flexible, durable, and sounds great. This is a great cable when you need the best sound quality in a medium/high-abuse environment. 2921 wire has four 14AWG conductors so supports dual channel or bi-amped applications and has an overall gloss black jacket. This is Mogami part number W3082. It is a heavyweight 14 AWG 2 conductor speaker cable that is very flexible, very thin (overall for a 14 AWG wire), durable, and sounds great. This is a great cable when you need the best sound quality in a medium/high-abuse environment. 3082 wire has two 14AWG conductors in a coaxial configuration and has an overall gloss black jacket. This is Horizon (RapcoHorizon) Mega-Flex Series 12 GA and 10 GA speaker cable. It is a heavy-duty flat (not overall jacketed) speaker cable with amazing flexibility. These cables sound amazing and are best for studio or fixed placement applications. This is Mogami's part number W2930-W2939. This is the best snake cable we work with. It is ultra-flexible, durable, and sounds excellent. This is great wire for studio applications (this is what the pro's use). Great for use in medium-abuse applications. This is Mogami's part number W3160-W3163. This is the best digital snake cable we work with. It is ultra-flexible, durable, and sounds excellent. This is great wire for studio applications (this is what the pro's use). Great for use in medium-abuse applications. This is Horizon's live sound grade snake cable. It is flexible, durable, and sounds great. This is a great cable when you're on a smaller budget and need excellent sound quality in a high-abuse environment. This is Carol's SJOOW 3 conductor power cable 12 GA, 14 GA, and 16 GA. It is a heavy-duty power cable with great flexibility (for power cable). These cables are very heavy-duty for tough environment perfect for most power needs. The power cable is heavyweight 14 AWG 3 conductor shielded cable with a foil shield with drain. Great for medium/high-abuse environment. Here is a chart of wire spec's.